As we see a wave of green on the interior trend horizon, we’ve pulled together some of our favourite Cotswold Co looks, products and styling tips to help you find ways of going a little greener in your home. Green offers a natural connection to the great outdoors. The colour green makes us feel calmer and a little closer to nature, so it’s unsurprising that it’s a natural fit with our countrified furniture. Green is incredibly neutral and easy to work into your decor without it feeling like a ‘safe’ option. As a backdrop to our furniture, green adapts beautifully to oak, pine or painted wood and adds an element of elegance, character and charm to any room. We loved the dappled paintwork of this historic hallway. The light removal of wallpaper and paint over the years had revealed this stunning pallet of green beneath, which worked wonderfully with our plethora of plants. You could recreate this kind of look by introducing a dado rail to your hall and anchoring the bottom half of the wall with a rich, earthy tone of green. 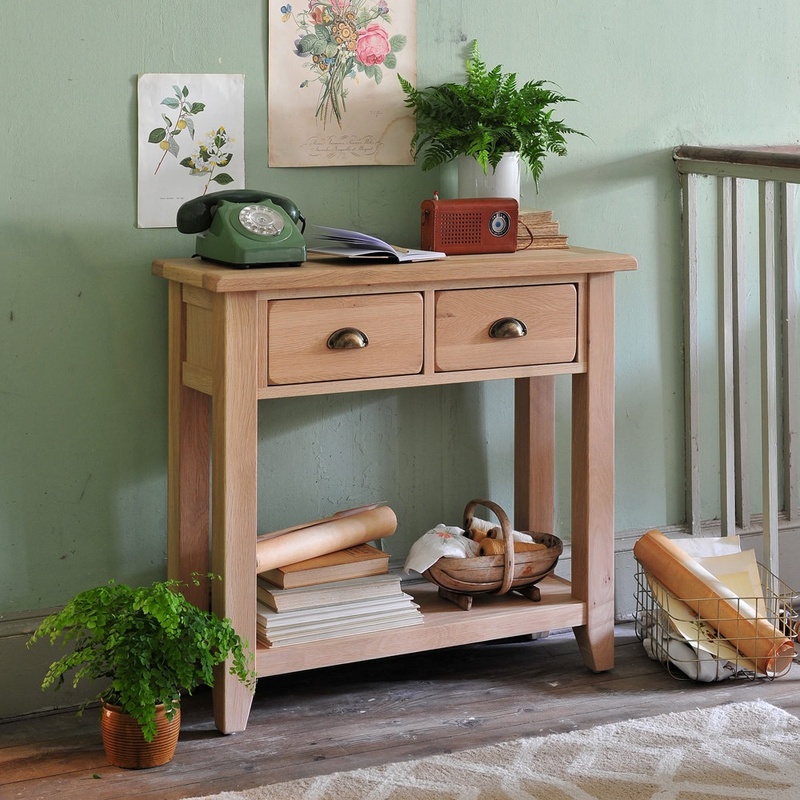 Going green with your furniture might sound a little too much commitment to the cause, but our Caldecote Range is painted with a subtle heritage green or ‘french grey‘ that will help you introduce the colour in a cool, calm, collected manner. This shade of heritage green has become hugely popular in country kitchens, so why not indulge in this lovely Larder; a great way to go green while gaining the ultimate storage saviour! There are infinite shades of green but generally speaking, we find the earthier tones suit our furniture fabulously. We loved this shade of Farrow and Ball, Green Smoke and thought it contrasted beautifully with our Florence Grey Range. It’s no surprise that natural, earthy green tones should work wonderfully well with wooden furniture, after all, Mother Nature rarely gets her colour pallet wrong. Our Natural Oak Range is a great companion for green walls and looks super styled with plenty of green foliage, botanical prints and a retro green phone. When you’re working with white furniture you can throw the rule book out the window. We found this pop green panelled wall looked incredible with our Chantilly Chest and thought that framing your key pieces with a bold shade of green like this was a great way of elevating your favourite furniture to another level. This bold green wall has been beautifully neutralised with a white wash and worn plaster. It’s a great, rustic effect to recreate with either green dyed plaster (if you’re starting from scratch) or a simple wash of watered down white paint and a gentle sand. Building layers of wall colour, plants and foliage as a way of accentuating your green story is a great styling trick. Try to incorporate multiple plant textures and tones into your green scheme and soon it will start to feel like a genuine style statement rather than a passive attempt. We loved creating this green on green effect by teaming our ‘Green Smoke’ painted wall with a beautifully understated bunch of green cabbage flowers. We mixed in a few white roses to give the bunch a lovely balance of softness and structure. A few key pots and ornaments in multiple shades of green can tie your scheme together perfectly. If you want to embrace a green scheme wholeheartedly the important thing is to have fun. Enjoy collecting, grouping, layering and displaying items in a tongue in cheek way and your home will become engaging and full of character. Let us know if you go green and share your schemes with us! WIN! BLOOM & WILD SUBSCRIPTION FOR MUM!